We’d love your help. Let us know what’s wrong with this preview of The Bookshop of the Broken Hearted by Robert Hillman. Tom Hope doesn’t think he’s much of a farmer, but he’s doing his best. He can’t have been much of a husband to Trudy, either, judging by her sudden departure. It’s only when she returns, pregnant to someone else, that he discovers his surprising talent as a father. So when Trudy finds Jesus and takes little Peter away with her to join the holy rollers, Tom’s heart breaks a Tom Hope doesn’t think he’s much of a farmer, but he’s doing his best. He can’t have been much of a husband to Trudy, either, judging by her sudden departure. It’s only when she returns, pregnant to someone else, that he discovers his surprising talent as a father. So when Trudy finds Jesus and takes little Peter away with her to join the holy rollers, Tom’s heart breaks all over again. Enter for your chance to win a copy of the heartwarming novel The Bookshop of the Broken Hearted by Robert Hillman! In this tender and wise novel about Enter for your chance to win a copy of the heartwarming novel The Bookshop of the Broken Hearted by Robert Hillman! To ask other readers questions about The Bookshop of the Broken Hearted, please sign up. I noticed a review refer to "parts of the book with animal death" because of some of the book's setting being a farm. I've just read two books in a row where there were unexpected passages of animal cruelty and I'm not up for more of that or for graphic descriptions, however short, of animal slaughter on a farm. How much is there is about animal death in this book and how graphic are the descriptions? The setting takes place in Australia and the year is 1968, twenty four years since Hannah and her own little boy arrived at Auschwitz. The book also goes to the past about the horror of what happened to her and her little boy in the concentration camps. Tom Hope is a farmer. His wife Trudy leaves him and he is so broken hearted. He really loved her. She then comes back to him after she is pregnant by another man. Then she decides to leave him again to go to the Jesus camp. She takes her son with her and Tom was the perfect father for Peter. My heart ached for him. Then there is Hannah Babel who owns a book shop in the town. I really loved this book and I am loving this genre more and more. This one is a dark one. I didn't care for the book shop parts in the book, if you want to read this one because you think it's about a bookshop then this one is not for you. This one is more for historical fiction lovers, and I think thriller fans might enjoy this too. It did have a slow burn in the beginning but after about 20 % the book picks up and I couldn't put it down after that. I loved the characterization of the characters. They were very well developed. My heart went out for Hannah. It tore at my heartstrings. She went through so much horror at the concentration camp at Auschwitz. I thought she ended up being a strong woman, since she had so much baggage. My favorite character was Tom. My heart ached for him. He was a good man. I loved Peter, Trudy's son. Of course I hated the pastor and the pastor's wife and really disliked Trudy. I fell in love with some of the characters but there were unlikable characters too. There were a lot of broken hearted characters. This one was an emotional read and tore at my heartstrings. I had so many different feelings and I thought the ending was so uplifting. It really made me feel good inside. It was such a beautiful loving ending. It was just the perfect ending. This was a Traveling Sister read and it is always fun to discuss a book that you love. Mary Beth *Traveling Sister* Judy wrote: "Excellent review Mary Beth! Very intriguing." Thank You, Judy! Just saw your comment! I really loved this one. I am loving the historical Judy wrote: "Excellent review Mary Beth! Very intriguing." I am a sucker for any books that take place in, around or about a bookshop. I also seem to be on an “Australian roll” having recently read Jane Harper’s “The Lost Man”. In the end, however, this book wasn’t anything that I had envisioned. There are definitely broken hearts in the story but not that much about the bookshop. Tom Hope is an Australian farmer and has had some terrible times mainly because of his choice in partners. He is a pretty quiet guy and when he meets Trudy who is young, vivaci I am a sucker for any books that take place in, around or about a bookshop. I also seem to be on an “Australian roll” having recently read Jane Harper’s “The Lost Man”. In the end, however, this book wasn’t anything that I had envisioned. There are definitely broken hearts in the story but not that much about the bookshop. Tom Hope is an Australian farmer and has had some terrible times mainly because of his choice in partners. He is a pretty quiet guy and when he meets Trudy who is young, vivacious and pretty, he is surprised that she will even look at him. They date, fall in love (well at least Tom does) and get married but within a few years Trudy is fed up with the farming life and wants more out of life, and one day just leaves. Tom is heartbroken. Within a year she comes back to Tom, pregnant with another man’s child and Tom takes her back. There is a lot of coming back in this book! I won’t go through the entire plot with Trudy as there is another woman we must focus on. Hannah was a hard character for me to understand or to even relate to in any way. She was a Holocaust survivor who has had her heart broken as she lost both her husband and son at Auschwitz. When she survives the camp she decides that Australia might be the best place to settle. She moves to the small town where Tom lives and decides to start a bookshop, she hires Tom to build shelves for her. Tom, not yet quite over Trudy, begins to have feelings for Hannah. It is never really clear to me why but Hannah is very clearly pursuing Tom, maybe it is because he is settled and a good man? That’s a question that still remains in my mind. After only a few months, they marry. Some happy years pass but then Peter, Tom’s adopted son, is finally returned to him from Trudy and the “Jesus Camp” where he had been living.The circumstances surrounding this, how his mother was able to take Peter away, I will leave for you to discover. This sort of came out of nowhere for me. Now there is the decision to be made, Can Hannah who lost her own little boy, come to care about Peter???? She has many questions she has to answer for herself and more explaining to do to Tom. I never quite connected to any of the characters in this book. Trudy was just a user of people, anything to get what she thought she wanted. With Hannah, I was never sure, even at the end how much she loved Tom or if this is just the life that she wants to live. Tom comes across as a good but weak man, he keeps taking these women back even after they have left him, one several times. This was a slow read for me. I did better when I was reading this for just a couple of hours and then coming back to it the next day. It is not a happy book, in many places it is extremely sad. I’m not sure about the message that the author was trying to convey with this book. I felt as though I was deeply entrenched with one story line only to be pulled away while Hannah relives her past life in Auschwitz and even before. I felt as though these two stories were only connected by the characters and definitely not because there were any similarities in the lives that Hannah and Tom had lived so far. I was also surprised that Tom would marry a woman so much older than him, who has already told him she will not have any more children. Tom knew how much he loved Peter and having a child around. I think the writing in this book is excellent with great descriptions of the land, the town and the residents. This book will be published on April 9, 2019. I will look forward to the next book from this talented author. This is a Traveling Sister read. Thank you to Penguin Publishing Group for providing an advance reader copy via Edelweiss. The success of this story hinges upon the appealing character of Tom Hope. The story takes place in a farming community in Australia called Hometown. Tom lives and works on the farm left to him by his Uncle Frank. Tom's good at a lot of things, but most of all, he's a good man. He can cook a wonderful breakfast and dinner, but can also build bookshelves, raise bountiful crops, tend to the "woolies" (sheep) a Thank you to Penguin Publishing Group for providing an advance reader copy via Edelweiss. The success of this story hinges upon the appealing character of Tom Hope. The story takes place in a farming community in Australia called Hometown. Tom lives and works on the farm left to him by his Uncle Frank. Tom's good at a lot of things, but most of all, he's a good man. He can cook a wonderful breakfast and dinner, but can also build bookshelves, raise bountiful crops, tend to the "woolies" (sheep) and other livestock with more of a caring heart than most. And when his wife Trudy suddenly leaves him and just as suddenly comes back...and confesses that she's pregnant by another man...Tom summons his quiet strength and does what his heart tells him to do...the right thing. He raises the little boy Peter as if he's his own, and he loves him just as much anyway. When Trudy leaves him for a second time, she leaves the boy behind for Tom to raise. It seems impossible how Tom's going to run the farm by himself while also watching a little boy, but they both thrive within their idyllic world of love. Then Trudy suddenly comes back again, having joined some kind of religious commune, demanding her boy back. Now Tom is alone, and when he delves into town to visit the general store he's hoping to avoid the questions on the minds of the watchful (but caring) neighbors in this close-knit farming community. Then Tom notices that a store on on the end of the shopping strip that never does well once again has a new occupant. He's intrigued by a paper affixed to the front door in the Hebrew language. Translated into English, it reads: "To the God of the Hopeless, Bless this shop." It was to be a bookshop, and the very attractive but quirky Hannah Babel was its proprietress. She always dressed to the nines as if on a modelling runway, and at forty-five and with just a touch of gray, she was still stunning. Tom receives a note on the farm from Hannah requesting him to do some work on the bookshop, such as hanging the sign and building some bookshelves. It's clear from the start Hannah finds Tom quite attractive, and with her preening, touchy-feely flirtations, they soon become lovers. The conflict simmering in Hannah's past is that she is a Holocaust survivor of Auschwitz. The horrors she experienced are so painful that she cannot speak of it. She lost her husband and little boy Michael in WWII. She is very strong and a survivor, but she cannot share this part of herself with Tom. Once Tom becomes romantically involved with Hannah, there are dueling chapters of the past and present where we experience the atrocities of the Holocaust with Hannah. I must admit that I was troubled reading the WWII retrospective chapters of Hannah and did not find these enjoyable, though they obviously were intrinsic to this story. Tom Hope awakens at 4 AM daily to milk the cows and then check on the woolies. The Australian farm he owns in the small town of Hometown, Victoria was an inheritance. Tom is quiet and soft spoken, awkward with people. His steady companion is his dog, an old heeler named Beau. Tom has discovered "...what a hit-or-miss business it was being married." His second wife Trudy, a city girl unhappy with farm life, abandoned him. One year later, Trudy resurfaced, pregnant by another man. Tom took her bac Tom Hope awakens at 4 AM daily to milk the cows and then check on the woolies. The Australian farm he owns in the small town of Hometown, Victoria was an inheritance. Tom is quiet and soft spoken, awkward with people. His steady companion is his dog, an old heeler named Beau. Tom has discovered "...what a hit-or-miss business it was being married." His second wife Trudy, a city girl unhappy with farm life, abandoned him. One year later, Trudy resurfaced, pregnant by another man. Tom took her back agreeing to raise the child. "...the sense of failure that troubled him [Tom] became too much to bear: not much of a farmer, poor husband, but he'd made a good job of being a father." While little Peter felt his mother's lack of love and affection, he called for Tom, ''...the man who was not his father." Farming became even more challenging when Trudy departed again leaving three year old Peter with Tom. Tom had to supervise the small boy but still shear his sheep. When milking the cows, Beau served as the babysitter. Peter is now five years old, has his school uniform ready, and is prepared for his first day of school. Trudy arrives and whisks her son away. She has joined a cult. Tom has no legal rights. He is not Peter's father. Both Tom and Peter are brokenhearted. A trip to town to combat sheer loneliness holds a surprise for Tom. A vacant store is being turned into a bookshop. Hannah Babel, bookshop owner and a Hungarian Jewish Holocaust survivor, is determined to succeed. "...you could probably claim that not a half dozen people in Hometown had ever opened the cover of a book and get [got] away with it." Hannah undeterred said, "They will read. They will come to Madame Babel. Don't worry." She hired Tom to build shelves to hold her voluminous stock of books for sale. She admired his expertise in carpentry. "Hannah...was interested in him...He had never before in his life been made to feel interesting." "He had accepted that Hannah was a fruitcake. It didn't ruin his liking for her..." He was in love! However, "...he grasped that she was suffering...that huge smile...but she was suffering." The three main protagonists in this tome, time and again, experience unspeakable loss and are brokenhearted. Tom is in love with Hannah but sometimes "every trace of tenderness had left her." In May 1944, Hannah, husband Leon and three year old son, Michael were rounded up and taken to Auschwitz. Hannah has vowed never to love a child again. Peter and Tom have an amazingly strong bond. Risks taken by Peter are to no avail. What is to become of these damaged souls? 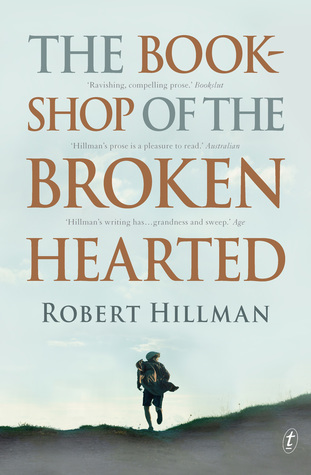 "The Bookshop of the Broken Hearted" by Robert Hillman encompasses a myriad of deep feelings, feelings of love, loss and the beauty of the land. A heartfelt read. Tissues required. Highly recommended. This story starts in 1968 Australia, with Tom Hope grieving his wife Trudy, who left him. Later Trudy comes back, pregnant by another man and Tom takes her back. Trudy has no love for her son Peter but Tom loves the boy as if he were his own, raising him for three years, while Trudy is still with him, and then for two more years, after Trudy leaves him again, alone to raise Peter. For Peter, Tom is his father and he loves Tom with all his heart. Then Trudy takes the boy and Tom's heart is broken This story starts in 1968 Australia, with Tom Hope grieving his wife Trudy, who left him. Later Trudy comes back, pregnant by another man and Tom takes her back. Trudy has no love for her son Peter but Tom loves the boy as if he were his own, raising him for three years, while Trudy is still with him, and then for two more years, after Trudy leaves him again, alone to raise Peter. For Peter, Tom is his father and he loves Tom with all his heart. Then Trudy takes the boy and Tom's heart is broken, not for Trudy who he has no love for anymore but for Peter, the boy he loves as much as he could love his own blood. Peter's heart is broken too, the place he is taken is not a good place and he dreams of being with Tom again. Into Tom's life comes Hannah, 12 years older than him, survivor of Auschwitz and other horrors. All of Hannah's relatives died during the persecution of her people and Hannah, although she survived, can never forget what she saw, heard, knew of those times. Heartbreaking losses that have have affected her mental and emotional health. She vows to never love another child after losing her own boy, the first day at Auschwitz. Hannah and Tom fall in love despite having to deal with Hannah's moods which are more than moods. They are really black spells when she is lost to Tom, as she relives past horrors. This story is a slow story and it's telling is in a different style than most stories. It almost feels as if we are in Tom's thoughts or Hannah's thoughts and sometimes some of the words get past me but I liked this book a lot. There is so much sadness and death and as strong of a man as Tom is, I had to wonder if losing Peter and being married to Hannah, was going to break Tom. I know this book won't be for everyone but I liked it. I liked the people, the good people, not the religiously obsessed crackpot people that Peter was sent to live with. I also dreaded the parts of the book with animal death but I know that comes with living on a farm so it had its place in the book. I felt for the people in this book, especially for Tom and Peter and for Hannah too, who lost everything, including her mind but still could imagine good things happening. Rounding up from 3.5 stars. First of all, let's be clear, while the title refers to a bookshop, this novel isn't particularly about the bookshop. There's a whole subgenre of bookstore fiction, sure to warm the hearts of booklovers everywhere. This isn't one of those books. Set in Australia, The Bookshop of the Broken Hearted tells the story of Tom, a lonely man who's been unlucky in love. Tom is a sheep farmer who lives a contented, quiet life, until his wife Trudy deserts him and takes away Peter Rounding up from 3.5 stars. Set in Australia, The Bookshop of the Broken Hearted tells the story of Tom, a lonely man who's been unlucky in love. Tom is a sheep farmer who lives a contented, quiet life, until his wife Trudy deserts him and takes away Peter, the son of his heart if not his body. When Tom meets Hannah, it's like he gets a new ray of sunshine in his life, and the two form a passionate, unbreakable bond. But Hannah's past haunts her in ways Tom can't quite understand, and when Peter reenters their lives, it may be more than Hannah can stand. The story is truly affecting in parts, and I came to love Tom quite a lot. He's sweet and good and loving, although he does seem to allow himself to roll with the punches rather than standing up to the people and events that hurt him. Tom's relationship with Peter is lovely, so when he's taken away, it is a heart-breaking development. The story of Peter's experiences at "Jesus Camp" is horrible -- he's essentially trapped there by a mother who's caught up in pastor's cult-like community, and I was really upset by Peter's suffering and the length of time it takes for him to finally be rescued. We hear about Hannah's past through chapters scattered throughout the book that show her experiences in the concentration camp and the years afterward. Of course, she's deserving of great sympathy, but there are times with Tom and Peter that's it hard to like her. Overall, this is a quiet and moving book. I loved the descriptions of Tom's farm and the Australian setting and landscapes. The writing is slow and underspoken, with a brevity that somehow makes the emotion harder to access at times. The juxtaposition of ranch life in Australia and memories of the Holocaust makes for an unusual mix, but it works. The Bookshop of the Broken Hearted is an unusual work of historical fiction, definitely worth checking out. At the outset, Tom’s last name seems cruelly ironic, because the guy can’t seem to catch a break. Trud This quixotic little book had me at hello. Set in Australia in the 1960s, it tells a story of love, loss, and redemption in a way that I’ve never seen anywhere from anybody. I’ve finished reading other books since I finished this one, and yet I am still thinking about Tom Hope. Tom is a farmer and lives outside a small town in Australia, he has been unlucky in love and his wife has left him. When his wife returns he finds out that she is pregnant with another mans child. Tom brings this child up as his own and loves the boy dearly. After his wife goes away for a second time Tom meets Hannah a survivor of Auschwitz and the new owner of the towns bookshop he finds love again. I really like the character Tom and his son Peter and very much enjoyed this book. I would like to Tom is a farmer and lives outside a small town in Australia, he has been unlucky in love and his wife has left him. When his wife returns he finds out that she is pregnant with another mans child. Tom brings this child up as his own and loves the boy dearly. I would like to thank NetGalley and Faber & Faber for my e-copy in exchange for an honest review. JanB This sounds like a heartwarming thoughtful read. Nice review! Tom was shy, Trudy wasn't happy. Trudy left Tom, came back pregnant, left again without her son, Peter, then came back again to take Peter away. Taking Peter away devastated Tom because he grew to love Peter and was the main caregiver even though he wasn't Peter's father. Tom was shy, Hannah was bolder. Tom had tragedy in his life, but nothing like Hannah's. Hannah had been in Auschwitz and had lost her husband and son in the camp. Hannah was a very interesting character and a perfect match for Tom. They both had their talents, and they both complimented each other and taught each other different things until Hannah's moods became worse. The Bookshop of the Broken Hearted will move you in the first few pages. If that isn’t enough, the writing alone is definitely worth the price of admission. And then there is the richness of the storytelling and the depth of emotion thrown in, too. Robert Hillman seems to get more across with fewer words than I would have thought possible. This is wonderful stuff. 2.75 stars Thank you to Penguin's First to Read and G.P. Putnam's Sons for a chance to read and review this ARC. Published on April 9, 2019. My expectation was way off for this book. I was expecting a light romance kindled in a bookstore. So far from the actuality of this novel. I felt that the book started out well, I really liked the main character Tom and also liked Peter, the son of Tom's wife. I also enjoyed the farm setting. I was still okay with the story when Tom met Hannah and helped her 2.75 stars Thank you to Penguin's First to Read and G.P. Putnam's Sons for a chance to read and review this ARC. Published on April 9, 2019. I felt that the book started out well, I really liked the main character Tom and also liked Peter, the son of Tom's wife. I also enjoyed the farm setting. I was still okay with the story when Tom met Hannah and helped her with the book store. But not long after that, I started to struggle. I usually like the alternating chapters that almost all authors have gone to recently. However, in this book, I felt that using that method made the story feel choppy and disconnected. Other than Tom and Peter I did not like any of the characters in the story. Maybe that was because I expected a light romance and this novel is not that. I wanted and expected a nice light love affair, inspired in a book shop. This novel is definitely not light. And I don't feel that the bookshop played that big a part - at least not as I had imagined it would. Hannah's plight also did not seem to fit into the rest of the story. I felt it was too big of a contrast. Instead of going from warm to cuddly, this story went from warm to razor wire. I can see where people may like this story, however, for me, it just did not work. Historical fiction set in a small town in Australia in the 1960’s and flashing back to Europe during World War II. Three characters’ stories are told: Tom Hope, a soft-spoken sheep farmer, Hannah Babel, a Jewish woman whose son and husband died at Auschwitz, and Peter Carson, the young son of Tom’s first wife who is taken by his mother to live with a religious cult. I thought the author conveyed a genuine sense of place and loved the descriptions of sheep farming. I felt an emotional attachment Historical fiction set in a small town in Australia in the 1960’s and flashing back to Europe during World War II. Three characters’ stories are told: Tom Hope, a soft-spoken sheep farmer, Hannah Babel, a Jewish woman whose son and husband died at Auschwitz, and Peter Carson, the young son of Tom’s first wife who is taken by his mother to live with a religious cult. I thought the author conveyed a genuine sense of place and loved the descriptions of sheep farming. I felt an emotional attachment to the nuanced characters. The plot gained momentum as it progressed. The title is a bit misleading, as the story is not set in the bookstore. It plays a role in the plot but is not the central focus. Hannah is attempting to establish a bookstore as a form of restitution for books burned by the Nazis. It also serves as a symbol of shattered lives being rebuilt. I don’t think it is coincidence that one of the main characters is named Tom Hope, as hope for the future is a common thread among the primary stories. Other themes include fear of abandonment, the will to survive, and the healing power of love. I felt the author was successful in portraying the guilt and psychological impact of the trauma Hannah experienced during the war. Each of the main characters is faced with trauma and all respond differently. I thought the book went a bit off-kilter toward the end and found the scenes of child abuse incredibly disturbing. I felt it was a well-written attempt to convey the human struggle to connect individual consciousness to a deeper meaning in life. I received an advanced reader’s copy from the publisher via NetGally in return for a candid review. I don't care for books that make me feel bad about myself and that's what this book did. I felt bad because I didn't like Hannah, one of the main characters in the book. I know I was supposed to because she was a survivor of Auschwitz and unspeakable tragedies but I didn't. Does being a survivor mean that everything has to go the way you want without the consideration of other people for the rest of your life? That's what Hannah thinks. After her release in WWII and a brief marriage to a weird I don't care for books that make me feel bad about myself and that's what this book did. I felt bad because I didn't like Hannah, one of the main characters in the book. I know I was supposed to because she was a survivor of Auschwitz and unspeakable tragedies but I didn't. Does being a survivor mean that everything has to go the way you want without the consideration of other people for the rest of your life? That's what Hannah thinks. After her release in WWII and a brief marriage to a weird second husband, Hannah moves to Australia to open a book store. With no regard what rural Australia might want to read, she stocks it with Russian classics and then rails against the town because they don't rush to buy them. She hires Tom, a handyman and nice guy, to build shelves. He has read exactly one book in his life and she gives him Crime and Punishment as his second. Really? Tom has a sad past with a truly screwy wife who runs off with the young boy they have been raising to a "Jesus Camp". The boy suffers there and wants to come back to Tom. Hannah, now Tom's wife, refuses to take him back. How the situation resolves will break your heart. This would have been a better book if I liked Hannah better but it will pull your heartstrings. As soon as you put “bookshop” in the title of your novel, you’re going to attract readers. Add to that the other reader siren calls: a setting seen through new eyes, a young child you want to root for, a romance, an uplifting message, a romance, and even the gates of Auschwitz. Robert Hillman has pressed all the buttons and normally, that would make me wary. But despite myself, I fell under the spell of this book. It’s set in the late 1960s in rural Australia, where two lonely people meet. One is As soon as you put “bookshop” in the title of your novel, you’re going to attract readers. Add to that the other reader siren calls: a setting seen through new eyes, a young child you want to root for, a romance, an uplifting message, a romance, and even the gates of Auschwitz. Robert Hillman has pressed all the buttons and normally, that would make me wary. But despite myself, I fell under the spell of this book. It’s set in the late 1960s in rural Australia, where two lonely people meet. One is Tom Hope (a symbolic name if there ever was one), who is broken-hearted after his unfaithful wife absconds with the boy he’s come to feel for as his own son. The other is a Holocaust survivor, Hannah, who is many years older than him, a little mad, yet impassioned about life. Tom and Hannah are an unlikely pair and there might be questions about the strong attraction. I took it on faith: both are broken people living in a sparsely populated area and have suffered loss. Under Robert Hillman’s crafting, Hannah comes uniquely and vitally alive – the dialog, the fears, the passions all feel true to life. And so does Tom. In the “what if I were the writer” department, there are a couple of things I might have done differently; for instance, Hannah’s back story might have ended at a pivotal place a bit earlier. But all in all, this is a page-turning book with a strong and hopeful message: when we let love into our lives it can do wonders and heal our broken hearts. Hannah has come to town and wants to open a bookshop though no one believes it will succeed. She hires Tom Hope to help her build some shelves. Tom recognizes a heart-broken person in Hannah as Tom is one himself. His wife Trudy left him and took her son, Peter, with her. Tom loved Peter like a son and he misses him dreadfully. Hannah, well, Hannah has met with more grief than most when she was taken to Auschwitz. Both of these broken-hearted souls will learn whether they can be healed or be hau Hannah has come to town and wants to open a bookshop though no one believes it will succeed. She hires Tom Hope to help her build some shelves. Tom recognizes a heart-broken person in Hannah as Tom is one himself. His wife Trudy left him and took her son, Peter, with her. Tom loved Peter like a son and he misses him dreadfully. Hannah, well, Hannah has met with more grief than most when she was taken to Auschwitz. Both of these broken-hearted souls will learn whether they can be healed or be haunted by their losses forever. Do you see how things can turn out? Do you see that the world is big enough to make certain things possible? That thirty-six years ago the German Student Union could hold a rally in Opernplatz, Berlin, and burn twenty-five thousand books, many written by Jews, the students rejoicing in their festival of loathing, and now this, in Hometown. Hannah’s bookshop of the broken hearted, a thing of beauty. An hour before he appeared in the shop, he had been covered in muck, rounding up the sheep, shouting at cows, putting his fingers to his teeth to whistle up Beau, and now he stood with a big smile telling farmers' wives where to find the Georgette Heyers. In a shirt and tie. Polished shoes. Black slacks with a pleat down each leg. If you loved a woman, this is how you might well end up. Dear God. At midday, he kissed Hannah good-bye and skittered back to the farm with a hundred things to attend to. She came to Australia with the bookshop still in her imagination and thought: How much farther can I go? This is where I stop. A very long way west of Budapest, of Auschwitz. She had read enough to know that we cannot speak of things that are “meant to be.” If her long journey from Europe to Hometown, to Tom Hope, to the bookshop of the broken hearted was meant to be, then Mein Kampf was meant to be, and the cleansing, the säuberung of the students in Opernplatz were meant to be. She said: “Too bad about that.” Hannah's happiness was great enough to embrace contradictions. It was without doubt meant to be, this bookshop that would bankrupt her, this love for a man who would one day notice her gray hair and her wrinkles more keenly than he did now. Too bad about that. For now, a little taste of paradise. This is a really touching story about people who are broken hearted and find through eachother a new placevand meaning in life. At the same time it is an ode about the power of culture and reading as a way to overcome unbearable things. I did like the book, but also had several things I thought weren’t the best. Some parts are unevenly long or short. There seems to be a lack of coherence. Too many people leave and come in a very abrupt way and it is not always psychologically credible. These and o This is a really touching story about people who are broken hearted and find through eachother a new placevand meaning in life. At the same time it is an ode about the power of culture and reading as a way to overcome unbearable things. Some parts are unevenly long or short. There seems to be a lack of coherence. Too many people leave and come in a very abrupt way and it is not always psychologically credible. These and other things didn’t make it the excellent read it could have been. Tom Hope is one of those stand-up strong men that should have a wonderfully happy life. Unfortunately, Tom doesn't fall into that camp. He's an Australian farmer and thrilled that pretty Trudy has married him. Farming life doesn't suit Trudy, however, and she leaves him broken hearted. Years later she turns up pregnant and wants to make another go of their marriage. Of course, Tom takes her back in and finds that he loves being a father and discovers joy in raising Peter for a time. True to the title, Tom's heart is broken again when Trudy leaves town with Peter. A new vibrant woman comes to town to open a bookshop, Hannah Babel, and she falls for Tom. I loved that she adored Tom because Trudy seemed totally indifferent to him. Hannah has come from Hungary and the horrors of Auschwitz. She has suffered many losses, but she is trying to make her bookshop a success and find happiness with Tom. This book has interesting characters that I didn't completely connect with, but I wanted to see them find happiness and fulfillment in the end. Thank you to Edelweiss, Robert Hillman, and Penguin Publishing for an ARC in return for an honest review. It is 1968: twenty-four years since Hannah and her own little boy arrived at Auschwitz. Migrating to Australia she meets solid, reliable Tom Hope and he is taking on a battle with heartbreak he can barely even begin to imagine. Good story, Tom and others move the story along while the past is lived again through Hannah and how she survived Auschwitz and the war. In rural late-1960's Australia, a handyman farmer has loved and lost when his wife cheated on him and then left because he's not exciting or interesting enough, but then he is hired to update a shop in town and build bookshelves for the new somewhat eccentric and exotic Jewish bookseller. Hannah Babel sees him as someone special. Tom is captivated, but he doesn't quite understand the whole of what he is facing when he gives love another opportunity. Hannah Babel has survived two husbands, her own child, Auschwitz and the Nazi SS, and then war-torn post war Europe under the Russians. She grew up educated and cultured in Budapest in a sparkling Bohemian environment. Nothing like her new home in sheep and farming country outside Melbourne. Tom is steady and salt of the earth. He performs each task with his best work which is as solid and quality as he is. His shining, contented and calm face with his quiet ways draw her in. The Bookshop of the Broken Hearted was a historical told in alternating timelines. There is the '60s timeline in rural Australia with Tom's life until he encounters Hannah and then they share the narration. There is also an earlier timeline told by Hannah that begins with Hannah's trials on the train to Auschwitz and these alternating with the later timeline until it bring things to her arrival in Hometown Austrailia. Woven between Hannah and Tom's stories is the story o Peter, who is the resulting child when Tom's ex left him and cheated on him before coming back with Peter. His mother couldn't or wouldn't love and care for him, but Tom did. Peter was dragged away from Tom when his mom went to live at a religious compound. Peter hopes for the day to come when he can go back to Tom. There is heartbreak aplenty in this story, but also a heartwarming story. Tom, who sees himself as a failure in many ways, is the shining light of this story. His everyday hero persona shines whether its a broken animal, his care over always doing a quality job, or the patience and forgiveness he can give to those who hurt him deeply. He sees past Hannah's crazed vitality to the sorrow within her and is a pillar of strength when she ends up in the dark places of her mind. Peter who is neglected and abused at the Jesus camp knows, even as a small child, that Tom is where his happiness lay. I was taken with all three and was deeply touched by their separate and combined stories. Daniel Lapaine, an actor I was familiar with in films, was the narrator of the story. It was brilliant having an Australian voicing a story set in Australia and told by an Australian writer. He voiced both genders, ages, and even Hannah's Hungarian Jewish accent quite well. Each character had their own tone and pacing that was great especially in a story that jumped timelines and three point of views. He caught the melancholy, the humor, the tragic, the love, and some of the every day life moments fabulously. I hope he narrates more books. All in all, I grabbed this book on a whim and came away deeply moved and teary-eyed a few times. It was simply told, but was profound. It was gently-paced much of the time and yet it was on my mind each time I had to set it aside. Those who enjoy engaging and character-driven historical romance should give this one a go. I am so pleased to have received an ARC of this novel from Netgalley and Publisher G. P. Putnam's Sons. It had me from the get go! My first great read for 2019. Robert Hillman is quite the author. There's a sparsness to his writing, and yet each character is wonderfully drawn, I feel as if I know each of them intimately. I could "see" the landscape, the buildings and settings. Just really well done, kudos. Late 1960s, rural Australia, a place called Hometown, and Tom, a giant of a farmer with a gentle heart, has had to endure his wife leaving him—twice--and her taking back the child she has left him to raise. Tom hurts, deeply, but isn’t a complainer, and puts on a friendly face for the community. Always helpful, he is the kind person that you see on his face. He meets Hannah, and is taken in with her unusual high spirit and seemingly candid nature. Hannah is a Jewish, middle-aged Hungarian woman w Late 1960s, rural Australia, a place called Hometown, and Tom, a giant of a farmer with a gentle heart, has had to endure his wife leaving him—twice--and her taking back the child she has left him to raise. Tom hurts, deeply, but isn’t a complainer, and puts on a friendly face for the community. Always helpful, he is the kind person that you see on his face. He meets Hannah, and is taken in with her unusual high spirit and seemingly candid nature. Hannah is a Jewish, middle-aged Hungarian woman with a history at Auschwitz and trauma, loss. She comes to Hometown to open a bookstore in a building that has a history of failed businesses. And, nobody in this rural outback even reads, it is alleged. Tom and Hannah, both grieving, have no common background, but for the emptiness of loss. They find a slice of sunshine between them, anyway. Can they last? Hillman’s novel is bittersweet for not being saccharine, sharp for not being bitter, generous for not being cumbersome. A delightful read, his winsome prose cutting deep at times. Not perfect, not flawless, but much to appreciate in finding your way Home. Or Hometown. Tom Hope wakes up one morning to find that his wife Trudy has left him. In the days that follow, he writes down things he would do to make Trudy happy if she were to ever return. Trudy does return ... pregnant by another man. He may not be much of a farmer or a husband but Tom is a wonderful father to their son, Peter. Trudy eventually takes off again, leaving Peter with Tom when she joins a holy roller community that Tom calls "Jesus Camp". When Trudy returns for Peter a couple years later, To Tom Hope wakes up one morning to find that his wife Trudy has left him. In the days that follow, he writes down things he would do to make Trudy happy if she were to ever return. When Trudy returns for Peter a couple years later, Tom is devastated. He has no legal rights to the child and watches helplessly as Peter is taken from him. Tom is soon hired to fix up some signs for the new bookstore run by the town's newest resident, Hannah Babel. Hannah and Tom fall in love and marry, surprising their community. The pair are busy running their farm and bookshop when Peter shows up unexpectedly, having run away from his mother and Jesus Camp. Peter's return stirs up many emotions for both Tom and Hannah. Tom doesn't want to lose Peter again and Hannah isn't willing to love another little boy again. Readers discover that Hannah had a son named Michael during WWII. The family arrived at Auschwitz and were immediately separated from her husband. Hannah and Michael were taken to the side by an officer. Exhausted Hannah fell asleep for a split second only to awaken and find her son missing. Her husband and son both died in the gas chambers within a week of their arrival. Tom feels he must choose between his love for Peter and Hannah. Hannah feels that caring for Peter will somehow diminish the love she has for Michael. When Peter's life with Trudy takes a dangerous turn, Tom and Hannah both have choices to make to restore their broken hearts. The Bookshop of the Broken Hearted is a tough book for me to rate. The story is heartbreaking and it reads quickly (I read it in a single afternoon). It's well-written but yet in a way that I felt I was only being told a summary instead of being in the story where I could learn about the characters and understand their emotions. So while the story is incredibly compelling it's execution fell flat for me due to the one dimensional characters. The book covers two time periods so readers can learn the stories of Hannah and Tom but there was no character development or descriptions to gain insight and better understand their thoughts and emotions. Thanks to G.P. Putnam's Sons and Edelweiss for providing me with a DRC in exchange for my honest review. The Bookshop of the Broken Hearted is scheduled for release on April 9, 2019. Set in Australia during the 1960’s, this novel is a story about Tom, a man whose heart was broken when his wife, Trudy, abandoned him. In addition, she took away her son, Peter, whom Tom had grown to love and consider his own. Living out on a ranch in the country, he doubts that he will ever find someone who cares about him and who wouldn’t mind living a quiet life away from the city of Hometown. Trudy, along with Peter, begins a new life in a “religious” cult. The strict laws that they are force Set in Australia during the 1960’s, this novel is a story about Tom, a man whose heart was broken when his wife, Trudy, abandoned him. In addition, she took away her son, Peter, whom Tom had grown to love and consider his own. Living out on a ranch in the country, he doubts that he will ever find someone who cares about him and who wouldn’t mind living a quiet life away from the city of Hometown. Trudy, along with Peter, begins a new life in a “religious” cult. The strict laws that they are forced to live under become unbearable for Peter. He dreams of returning to live with Tom. Hannah is new to Australia. She is a survivor of Auschwitz. Her family did not survive and Hannah is grieving. Hoping to start a new life, she arrives in Hometown where she decides to open a bookshop and share her love of literature. But first she will need help with carpentry. One of the merchants suggests she ask Tom for help. In this beautifully written novel, the lives of these three lonely, brokenhearted people become entwined. It’s a story of loss, perseverance, forgiveness, family, and the power of love to to bring hope and joy even in the darkest of times. Thank you to First to Read, author Robert Hillman, and G.P. Putnam’s Sons, an imprint of Penguin Random House for giving me the opportunity to read the ARC of this novel. 3,5/5. This book is far to be in my favorite or usually genre. But if you want me to read any book, just put book, bookshop, bookcase, library or anything bookish word and I would jump into it blindly! I'm glad I did with this one. The writing is good, simple, not over written, but good and masterize writing. The story has some religion in it, some historical parts and some romance, so if that kind of read usually please you I definitely recommend you to have a look. Personally, I would have tak 3,5/5. This book is far to be in my favorite or usually genre. But if you want me to read any book, just put book, bookshop, bookcase, library or anything bookish word and I would jump into it blindly! I'm glad I did with this one. The writing is good, simple, not over written, but good and masterize writing. The story has some religion in it, some historical parts and some romance, so if that kind of read usually please you I definitely recommend you to have a look. Personally, I would have taken more bookish part and a bit less historical/religion, not that it wasn't good, just didn't pick this book for it. The romance is well done, not cheesy and it looks real, which is soooo rare! My deepest problem, and it isn't even that big, was that the characters are a bit flat, not blank, but flat, they sure have history and background, but the psychological and emotional elements could have been put more in the front scene. Way over my expectation! Well done! After many years of teaching in high scho Robert Hillman is a Melbourne-based writer of fiction and biography. His autobiography THE BOY IN THE GREEN SUIT won the Australian National Biography Award for 2005. His critically acclaimed MY LIFE AS A TRAITOR (written with Zarha Ghahramani) was shortlisted for the Prime Minister’s Literary Award for Non-Fiction in 2008 and was published widely overseas.